Blue links VARIA previous projects; facts, texts, quotes, photo/text-documentation etc. Texts below; VARIA history, video links, about VARIA bigger festival events, Nuläge. VARIA Grows Nordic & Big Under -10, participating artists etc. VARIA Lab 2013, participating artists etc. VARIA Invites Mr. Morrish - 13, participating artists etc. VARIA2015 May-part, participating artists etc. VARIA2015 November-part, participating artists etc. VARIA2006, VARIA2007, VARIA2008, VARIA2009, VARIA2010, VARIA2011, VARIA2012, VARIA2013, VARIA2014, VARIA2015 and VARIA2016 has enabled performers of diverse artistic backgrounds, age and ethnicity to access a broad audience. Intense artistic and individual interaction is furthermore supported by a creative license, beyond expectation. Previous festivals have generated interest, cultivating a new breeding ground for ideas within the dramatic arts and collaborations between various media and much, much more. Audience indication and student and participant reflection reveal VARIA to be a place where innovation is given a great deal of invaluable space. As a result, VARIA has been able to create a forum for further, as of yet, unproven collaborations, aimed for the dramatic arts and arts of other focus. Lisa Larsdotter Petersson first initiated VARIA -04 and then realized the first festival -06. Since this time she has planed and arranged VARIA festival events including connected projects. VARIA2016 gave during two November-weeks substantial and generous Performance Program and Educational Program. Thirteen artists from Sweden, USA, Australia, France, Norway, Holland and England participated. Performance program included meetings between dance, movement and music, sound, language, alongside Solo Performance and Danced Lecture. Educational part was filled with workshops, classes and individual coach. This VARIA festival was seen and highly appreciated by large audiences alongside many students from Sweden as well as other countries. VARIA2016 was curated and produced by Lisa Larsdotter Petersson. VARIA2015 offered two periods, in total eight artists participated and came from Sweden, Australia and France. One part was realized in May and the second larger part in November that also carried the theme - Solo. Programs consisted of presentation, educational-program, performance and a seminar. All in all, a good year with intensive festival occasions, seen and highly appreciated by a big public alongside student participation. The solo-focus was greatly displayed and gave wish for more. 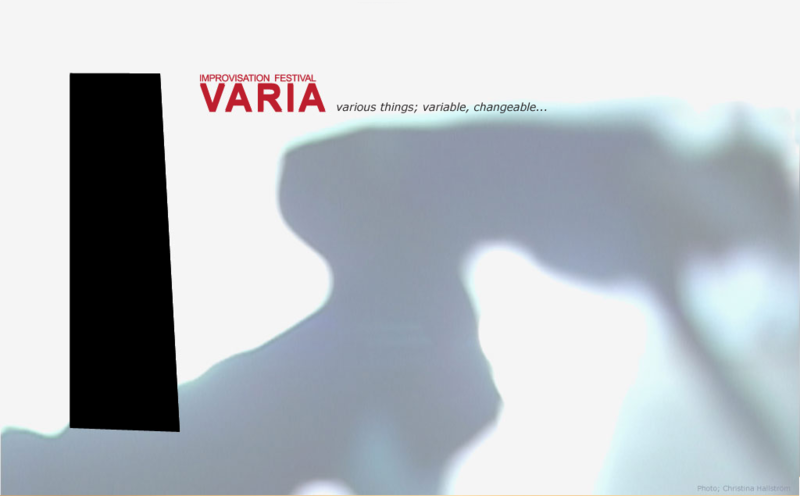 VARIA2015 was curated & produced by Lisa Larsdotter Petersson and co-produced by Jannine Rivel. Andrew Morrish visited VARIA before. It is a pleasure to have him around, why this time project was named accordingly. Intensive period started with improvisation workshop & individual coaching for professional artists joining the workshop etc. from a wide range of media. Interest for Morrish special approach to techniques within movement, voice, language alongside feedback structures parallel to practical work, has increased much over the years. Morrish developed unique methods of sharing knowledge with in the Art of Improvisation. Part of program was also public conversation between Morrish and Lisa Larsdotter Petersson. The artists shared space, asking each other questions related to their artistic process. Further the project presented Solo Performance evening, where Morrish, Petersson and drummer Henrik Wartel performed solo´s for a full house. The solos gave great representation of diverse improvisation performance, with mix of non linear storytelling, dance/movement, sound/music score at Danscentrum Väst, Göteborg in September -13. The media dance, music, video and light where represented along with Performance art and Action theatre. A big international audience and students passed by the many options of the festival, and took part of great meetings between art and people, work and studies, conversation and thoughts… VARIA2009 received support from Konstnärsnämnden, Nordisk Kulturfond, Göteborgs Stad Kultur, Västra Götalands Regionen, Konst-Kulturutveckling Danskontoret VG Region and AB Volvo. VARIA2009 was a collaboration with ABF Göteborg, Borås Konstmuseum, Stenungsunds Kommun and Danscentrum Väst. Nuläge Is part of, and is also the title of VARIA’s venture to convey the art of improvisation, interdisciplinary dance and theatrical interaction, beyond the urban limits. Are you interested in arranging a Nuläge in your area!? Don’t hesitate to contact VARIA. Several working models of Nuläge directed both towards the more established venues and also towards arenas that are new to the dramatic arts, already exist. VARIA provides performance, discussion forums, lectures, workshops/courses, and video demonstrations depicting a colourful art form.